So Whadja Think? : This book was hella loooooong. If you were totally sucked into the ups and downs of Abby and Travis, then it was a good thing; if not, it dragged. So much happened in the first third of the book that I stared at the remainder, wondering what the heck was left to say. The characters were definitely set in concrete, meaning they were definitely “types.” Luckily, they did develop a tad beyond, but not much. I was very intrigued by the fighting scenarios, the Vegas connection and Abby’s life prior to college. What I was not enamored of was Abby herself, as well as the ping-ponging of her affections. I was fascinated by the fact that Abby thought that she was the one that wasn’t good enough for Travis, so much that I wish that it had been a stronger theme. It would have made me a little less annoyed at her explosions with Travis, the back and forth of being broken up or dating. So tedious. A lot of the clutter could have been cleared out to make this a more streamlined story. I think that at least one-third of the book could have been eliminated and it would have been tighter and more enjoyable. My main gripe, though, is the flimsiness of the plot devices. Seriously, she loses a bet and since she never “welshes” on a debt, she forced herself to stay with Travis, not only in his apartment, but in his bed? And she goes to Thanksgiving at his Dad’s house because she doesn’t want them to have a horrible Thanksgiving and agrees to keep up appearances even though she and Travis are no longer together? There are many more of these contrivances throughout the book as well. Some reviewers have taken offense at their relationship and tried to turn it into some kind of dysfunctional romance that will turn sour once Travis throws the first inevitable punch at Abby. I took the story at face value, seeing two people who are products of their environment, yes, but, as with any YA/NA romance, people who will be able to redeem each other. It just took a long time to get there. The Bottom Line: I so wish this had been better, as the bones of the story were new and fresh. Plus, this is a series…really? 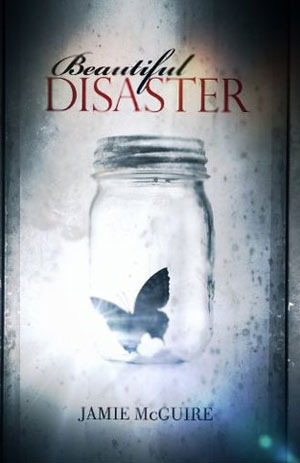 Beautiful Disaster by Jamie McGuire was published November 27, 2012 by Atria Books. Ink and Page picked this book up from the library, so no one had a choice about whether it was reviewed. I’ve heard so much about this one, to the point where I want to read it based on pure morbid curiosity. I wish it could have been better for you though. Oh you should read it. Many people loved it; it just didn’t completely grab me. Thanks for linking to my review (even though it was less than stellar). I did have a problem with their relationship, but I think the bigger part of the problem was the whiplash that the story was giving me. I completely agree with you that a good 1/3 of the book could have been taken out and that would have made the book much better. You’re welcome – I think it was love or hate for most people on this one.